Due to a restricted life-cycle, garage doors start showing signs of wear and tear after a certain point of time. Do you think your garage door is not as efficient as it used to be? Has it been a long time since you got your garage door repaired? Issues like incorrect force settings, broken springs or cables or garage door going off-track are very common and may cause fatal damage to your door or property if left unaddressed. Eagle Garage Door Service has been the leading providers of garage door service in Paterson, NJ for over 10 years. 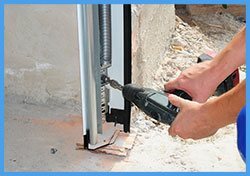 Our experts have the right set of skills and talent that is required to handle the complexities of a garage door and are known to provide inexpensive albeit quality repairs. We can fix doors of all sizes and types and are available 24x7 so that you don’t have to take a rain check on an impending repair job. A lot of complex mechanics and intricate detailing goes into the functioning of a garage door, right from the cohesion of several mechanical components to the appropriate installation of quality torsion springs. Your garage doors are bound to show serious signs of trouble if you rely on local technicians who lack skills in handling such complex issues. It is important to choose a garage door company that has years of experience in handling such issues and can identify any drawbacks in your system and carry out corrective repairs. Eagle Garage Door Service has a wonderful team of technicians who will conduct an inspection at your location to analyze components, spring tension, cable function, force settings on the opener, door hardware, etc. and identify areas of trouble. After their thorough inspection, our technicians will tell you how to take corrective measures to resolve your issues so that you can make a well-informed choice. Accidental car collision, a break-in attempt or aging can damage your garage door and render it inoperable. It is very important to address a damaged door since it may lead to further security or safety threats. Call Eagle Garage Door Service and we will send our garage door technicians to your location at once. Whether you are located at a remote are or need an emergency service in the middle of the night, don’t hesitate to call Eagle Garage Door Service. 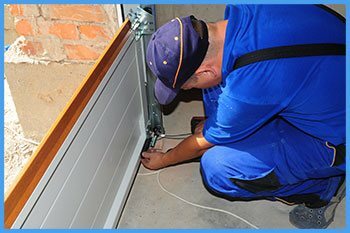 We can cover any area within Paterson, NJ and our services are available 24x7 so that you don’t have to stay with a faulty garage door for long. Garage doors are susceptible to go off-track due to several reasons. Changing weather, sudden rise or drop in temperature, cables or springs breaking off in one end may call cause your garage door to leave its track. Sometimes, obstruction during closure, aging, and impact due to weighty loads can also cause a similar situation. Give Eagle Garage Door Service call if your garage door has gone off-track and we will send our technicians to your location. It is essential to know that garage doors are highly-complex systems that weigh hundreds of pounds. Any attempt to fix them yourself may end up in personal harm or destruction of valuable assets; therefore, it is advisable to leave such issues to capable technicians. If you need quality service with zero damage, you have come to the right place. Call Eagle Garage Door Service for all your garage door repairs.